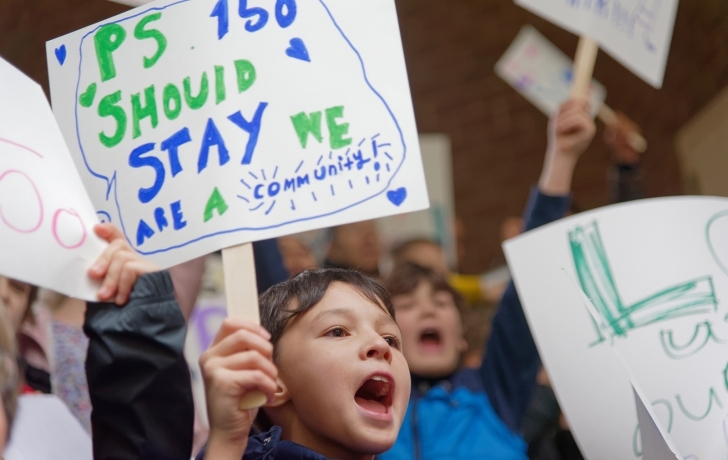 Chanting “Save Our School!” and waving hand-printed signs of protest, dozens of PS 150 students got their first taste of political activism Tuesday at a rally aimed at keeping their school in Tribeca. The children crowded onto the steps of Independence Plaza, the apartment complex that houses PS 150, and cheered elected officials and parent leaders as they called on the Independence Plaza landlords, Vornado Realty Trust and Stellar Management, to scrap their plans to evict the school from their building at the end of the school year. Unless the owners can be persuaded otherwise, the one-class-per-grade school community will have to “co-locate” to a floor of the Peck Slip School in the Seaport a mile away. PS 150 advocates want the school to remain in its Tribeca home at least until it can move to a new building at 42 Trinity Pl., expected to be completed in 2022. “Asking the PS 150 community to reinvent itself every four years is an outrage,” said Assemblywoman Deborah Glick. At the rally, PS 150 advocates called for the owners and city education officials to return to talks over extending the school’s lease. “We are urging Vornado and Stellar to come back to the table to talk to [the Department of Education and School Construction Authority] and find a better solution to keep PS 150 here,” said City Councilwoman Margaret Chin. “Act like grownups and go into this room and make this deal!” shouted Community Board 1 Youth and Education Committee Chair Tricia Joyce, to the cheers of children standing behind her. “We’re happy to discuss further options with the landlord, including in partnership with local elected officials,” a DOE spokesman said in a statement on Tuesday. A spokesmen for the landlords did not respond to recent questions from the Trib but referred to the owners’ Oct. 18 letter sent to Chin. Explaining their position on a lease extension, the owners cited uncertainty over the school’s future dating back to 2013 when the DOE had a plan, later abandoned, to move the school community to a new building in Chelsea. It also noted “the need for additional residential units and amenities” at Independence Plaza. Both factors, they said, meant that P.S. 150 would have to leave the building. The owners agreed to a three-year extension in 2015, then what they underlined as a “final” one in March 2018, allowing the school to stay one more year. Parents learned of that final extension in October. The owners said that as far back as June the DOE had confirmed to them that it was “committed” to relocating the school.